This is something I have come up with to help describe what happens to protein when we exercise. Building muscle is not an easy thing to do. There are many variables that must be considered when building muscle; genetics, age, anabolic properties, muscle cell size and number, and protein suspension factors. * Genetics: is the DNA coding of the cells that provide the information necessary for constructing the body and keeping the systems operating. If there is a code in the double helix that is written, chances are that code is not going to change. For example, if the code transcripts that a person will only have so many muscle fibers or will only produce so much anabolic hormones then that is what the person has to work with. Some folks have the gift of great genetics and some people have poor genetics. * Age: This is common sense. The older we get the less protein we can suspend. The cells are fewer in number and the hormone concentration drops considerably. However, by avoiding age acquired dangerous habits (poor diet, smoking, alcohol, drugs) a person can reduce the aging effects. * Anabolic Properties: We all have a central nervous system. Within the central nervous there are two subdivisions; the parasympathetic nervous system and the sympathetic nervous system. The nervous system is the electrical transmitter source of the body. All tissue is stimulated by the nervous system. This excitability forces the cells to turn on and work. The electrical charges are influenced by hormones in the body. There are two major categories of hormones; anabolic and catabolic. The anabolic hormones are the ones that are responsible for providing growth and stimulation of cells. Catabolic hormones help to regulate cellular activity by turning off receptors. Everyone has a certain amount of both types of hormones. How much a person has is dependent on genetics and cellular activity. * Cell Size and Number: We are born with a certain number of muscle cells and the size of those cells are also pre-configured. This is the unfortunate aspect of bodybuilding. A person can only build their muscles so big based on the number of the muscle cells they have. The only gains they can make is by building the size of the muscle cells. Guys that have a high concentration of fibers have the ability to build enormous muscles, while guys that have a low concentration of fibers can not build enormous muscles. *Protein Suspension: In my book InVINCEable I introduced this concept– protein suspension. This is something I have come up with to help discuss how muscle is transient. When we lift weights we are trying to influence an anabolic affect on the muscle. Making the muscles bigger is the goal. Weight training causes a temporary breakdown of the muscle cells. During the recovery phase the muscle is recovered and the protein reestablishes itself. After each training and recovery cycle a little protein is sustained, I call this protein suspension. 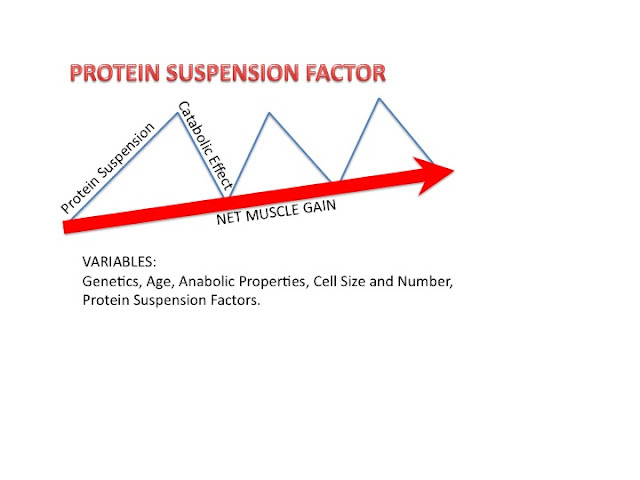 The reason why I call it protein suspension is because that is really what is happening. We are forcing more work on the muscles, therefore more protein is needed to keep up with the cellular demand. It is as if the protein is suspended in the muscle. This is why we get bigger muscles. The protein demand is greater and absorption is higher. But the moment we stop training or stimulating the muscle with high intensity muscle cells shrink back to their original DNA make up– muscle atrophy. We lost the protein suspension and the muscle no longer holds onto the added protein. The key to bodybuilding is trying to find ways to keep the protein suspended in the muscles to last longer than the DNA coding allows. We are constantly fighting our genetic make up. I have noticed that I will be totally pumped up and feel that my muscles are full of protein one day and then a week later my muscles feel small and the protein concentration has dropped considerably. I have gone into a catabolic affect. Maintaining muscle tissue is not an easy thing to do. Anyone can weight train, but not everyone can maintain their gains for long periods of time. At some point the protein will deplete from the muscle and the muscle will shrink back into the original genetic code. Some people have it easy and have a greater protein suspension than others. They are able to suspend protein for months, even years, without much loss. While the rest of us are unable to suspend protein for more than a couple days or weeks. When I got into bodybuilding I never expected the difficulty it is to keep the muscle. I can notice changes with my physique almost on a daily basis. I know my body well enough to know when I am losing protein. I have to really be on my diet and supplement schedule to avoid catabolism. The key to it all is protein suspension. By mastering protein suspension you will be able train hard, recover and increase the net gain of muscle protein. There is a fine line between anabolism and catabolism. tags: daryl conant, protein suspension, vince gironda, ron kosloff, muscle building.